Now back in print, this highly regarded book has been updated to reflect recent advances in the theory of semistable coherent sheaves and their moduli spaces, which include moduli spaces in positive characteristic, moduli spaces of principal bundles and of complexes, Hilbert schemes of points on surfaces, derived categories of coherent sheaves, and moduli spaces of sheaves on Calabi-Yau threefolds. The authors review changes in the field since the publication of the original edition in 1997 and point the reader towards further literature. References have been brought up to date and errors removed. Developed from the authors' lectures, this book is ideal as a text for graduate students as well as a valuable resource for any mathematician with a background in algebraic geometry who wants to learn more about Grothendieck's approach. Preface to the second edition; Preface to the first edition; Introduction; Part I. General Theory: 1. Preliminaries; 2. Families of sheaves; 3. The Grauert-Mullich Theorem; 4. Moduli spaces; Part II. Sheaves on Surfaces: 5. Construction methods; 6. Moduli spaces on K3 surfaces; 7. Restriction of sheaves to curves; 8. Line bundles on the moduli space; 9. Irreducibility and smoothness; 10. Symplectic structures; 11. Birational properties; Glossary of notations; References; Index. 'The authors have created a true masterpiece of mathematical exposition. Bringing together disparate ideas developed gradually over the last fifty years into a cohesive whole, Huybrechts and Lehn provide a compelling and comprehensive view of an essential topic in algebraic geometry. The new edition is full of gems that have been discovered since the first edition. This inspiring book belongs in the hands of any mathematician who has ever encountered a vector bundle on an algebraic variety.' 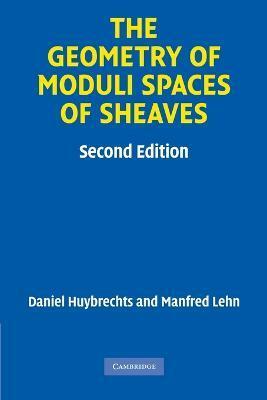 Max Lieblich, University of Washington 'This book fills a great need: it is almost the only place the foundations of the moduli theory of sheaves on algebraic varieties appears in any kind of expository form. The material is of basic importance to many further developments: Donaldson-Thomas theory, mirror symmetry, and the study of derived categories.' Rahul Pandharipande, Princeton University 'This is a wonderful book; it's about time it was available again. It is the definitive reference for the important topics of vector bundles, coherent sheaves, moduli spaces and geometric invariant theory; perfect as both an introduction to these subjects for beginners, and as a reference book for experts. Thorough but concise, well written and accurate, it is already a minor modern classic. The new edition brings the presentation up to date with discussions of more recent developments in the area.' Richard Thomas, Imperial College London 'Serving as a perfect introduction for beginners in the field, an excellent guide to the forefront of research in various directions, a valuable reference for active researchers, and as an abundant source of inspiration for mathematicians and physicists likewise, this book will certainly maintain both its particular significance and its indispensability for further generations of researchers in the field of algebraic sheaves (or vector bundles) and their moduli spaces.' Zentralblatt MATH "This book fills a great need: it is almost the only place the foundations of the moduli theory of sheaves on algebraic varieties appears in any kind of expository form. The material is of basic importance to many further developments: Donaldson-Thomas theory, mirror symmetry, and the study of derived categories." Rahul Pandharipande, Princeton University "This is a wonderful book; it's about time it was available again. It is the definitive reference for the important topics of vector bundles, coherent sheaves, moduli spaces and geometric invariant theory; perfect as both an introduction to these subjects for beginners, and as a reference book for experts. Thorough but concise, well written and accurate, it is already a minor modern classic. The new edition brings the presentation up to date with discussions of more recent developments in the area." Richard Thomas, Imperial College London "The authors have created a true masterpiece of mathematical exposition. Bringing together disparate ideas developed gradually over the last fifty years into a cohesive whole, Huybrechts and Lehn provide a compelling and comprehensive view of an essential topic in algebraic geometry. The new edition is full of gems that have been discovered since the first edition. This inspiring book belongs in the hands of any mathematician who has ever encountered a vector bundle on an algebraic variety." Daniel Huybrechts is Professor in the Mathematical Institute at the University of Bonn. Manfred Lehn is Professor in the Mathematical Institute at Johannes Gutenberg University, Mainz, Germany.